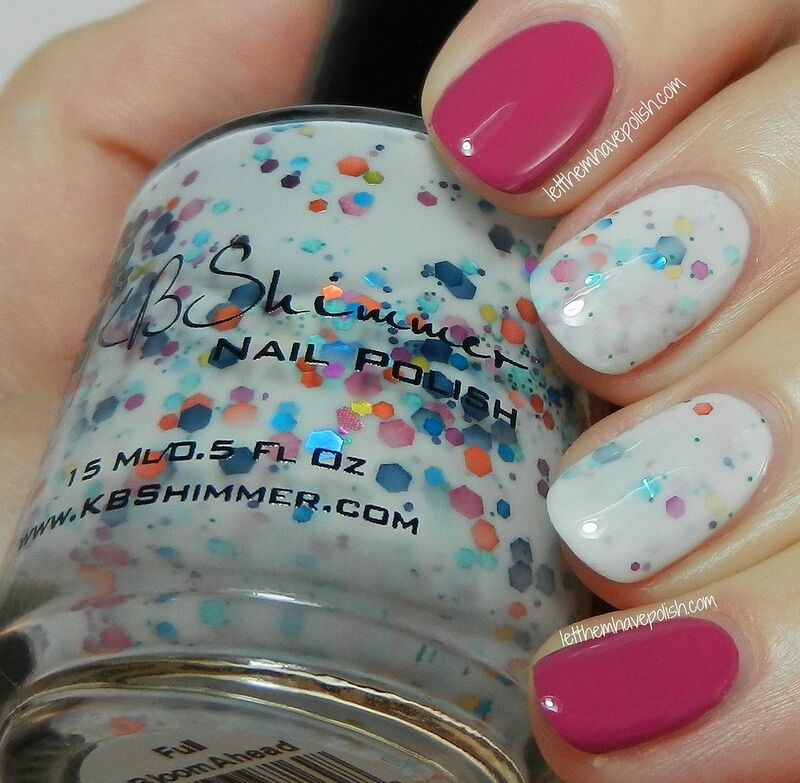 Today I want to share some pairings I did with the KBShimmer 2014 Spring collection. I have been so excited about this release for a very long time. 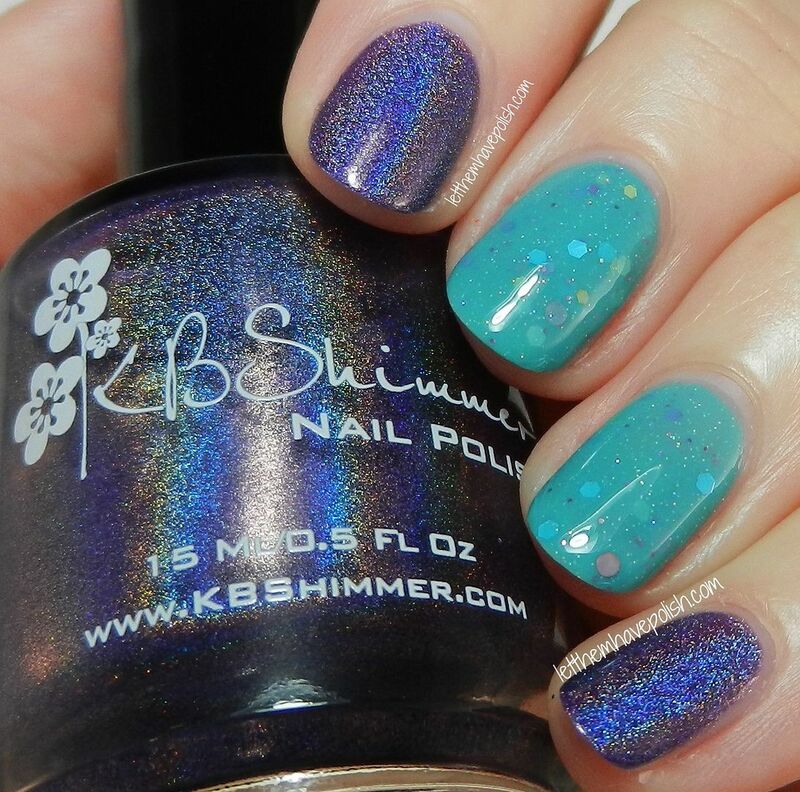 I was SO stoked to see that KBShimmer would be venturing into creme territory. In this release Christy gave us Eight brand new creme shades that are absolutely dreamy. She also released Six new crelly-glitters, a new glitter topper, an amazing holo shade as well as a holo top coat. I decided I needed to wear these, not just swatch. I wore them as pairs, bringing the cremes and glitters together into funky combinations. All swatches shown with a top coat of KBShimmer Clearly on Top. KBShimmer Quick and Flirty and KBShimmer Laugh Myself Lilly- Quick and Flirty is a mind blowing, true Purple linear holographic. The holo effect is spectacular in this baby. I love that the holo came through even in artificial lighting. Quick and Flirty has an amazing, two coat, formula. Laugh Myself Lilly is a beautiful, light Aqua crelly base. Packed in the base are small prismatic twinkling glitter as well as hexes and dots in aqua, lavender, gold and purple. This shade has a great formula and does well in Two easy coats. KBShimmer Life Rose On and KBShimmer Full Bloom Ahead- KBShimmer Life Rose On is a perfect shade of vivid Magenta creme. The formula on this creme is perfection. I just knew Christy's cremes would be amazing in every way. I used Two coats of this beautiful shade. KBShimmer Full Bloom Ahead is a classic KBShimmer, white-base, crelly. Packed in the White base are hexes in varying sizes and vivid colors. I can pick out navy, orange, aqua, gold, light blue and pink glitter. I used Two easy coats of this beautiful shade. This is one of my favorite combinations ever!! I just love the look of a dove gray and a hot coral together. 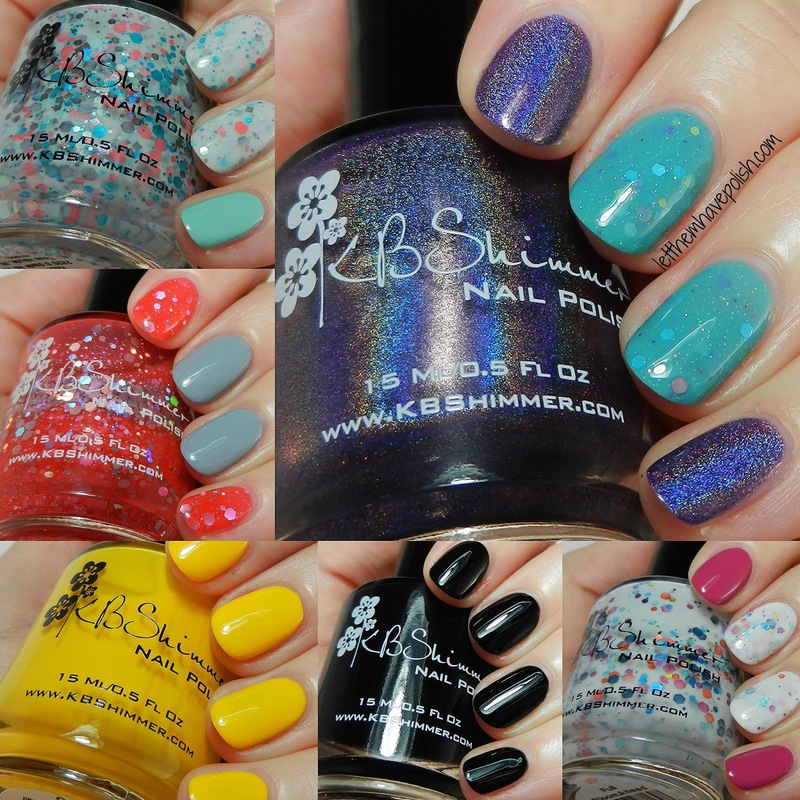 Featured are KBShimmer Belle of the Mall and KBShimmer My Life's Porpoise. KBShimmer Belle of the Mall is a crazy vivid coral-pink jelly base packed full of prismatic hexes in varying sizes. I used Two easy coats of this fun shade. KBShimmer My Life's Porpoise is a perfect shade of creamy dove grey. I used two flawless coats of this beautiful shade. So... I dinged my index while taking photos lolol... Featured are KBShimmer Make my Gray and KBShimmer Touch of Glass. KBShimmer Make my Gray is a beautiful, uber muted, grey crelly base. Packed in the base are hexes in bright coral, aqua, black, seafoam and blue. 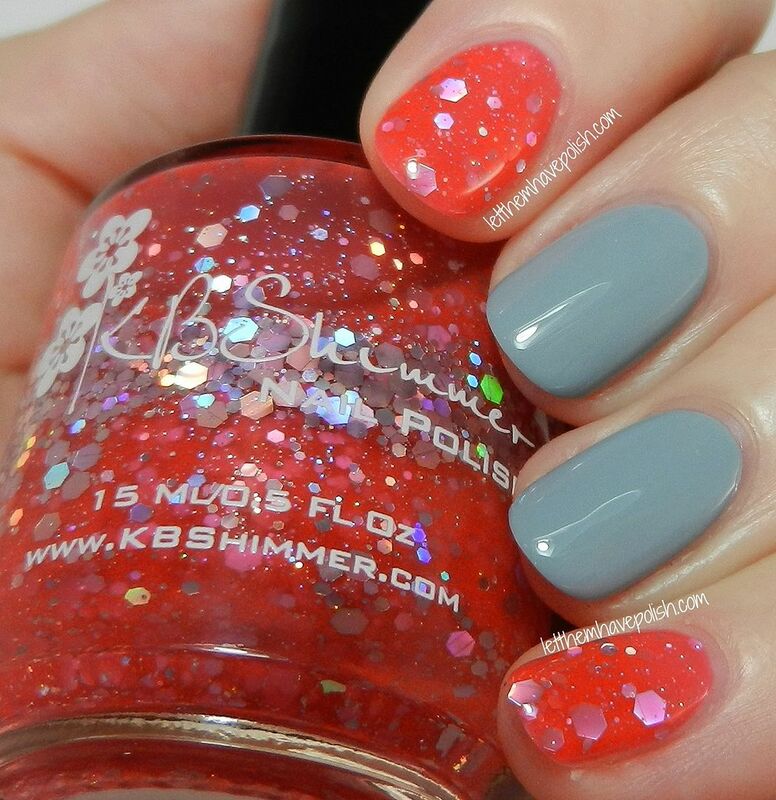 I ADORE this shade and the pops of coral glitter in the muted base. I used two easy coats of this color. 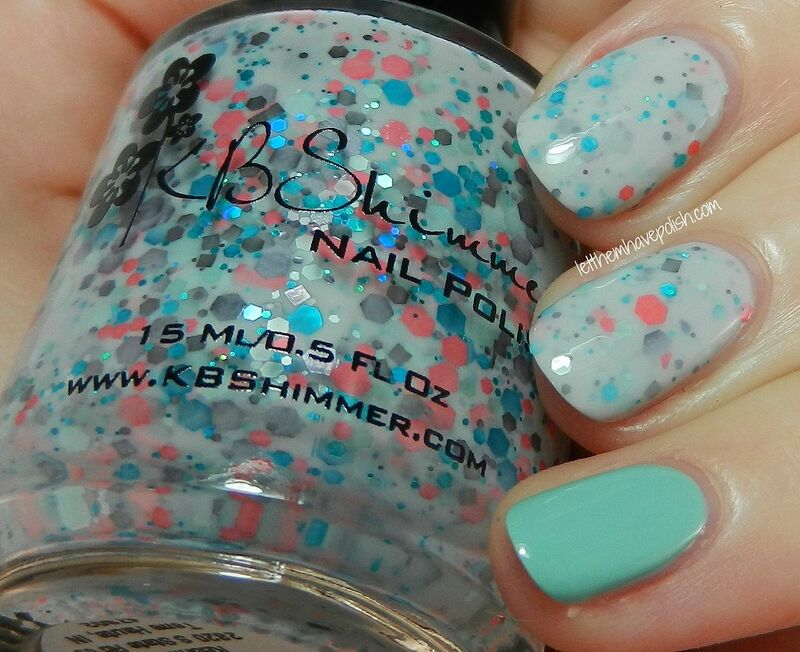 KBShimmer A Touch of Glass is a gorg shade of soft Tiffany Blue with a slight hint of shimmer. I used Two easy coats of this shade. 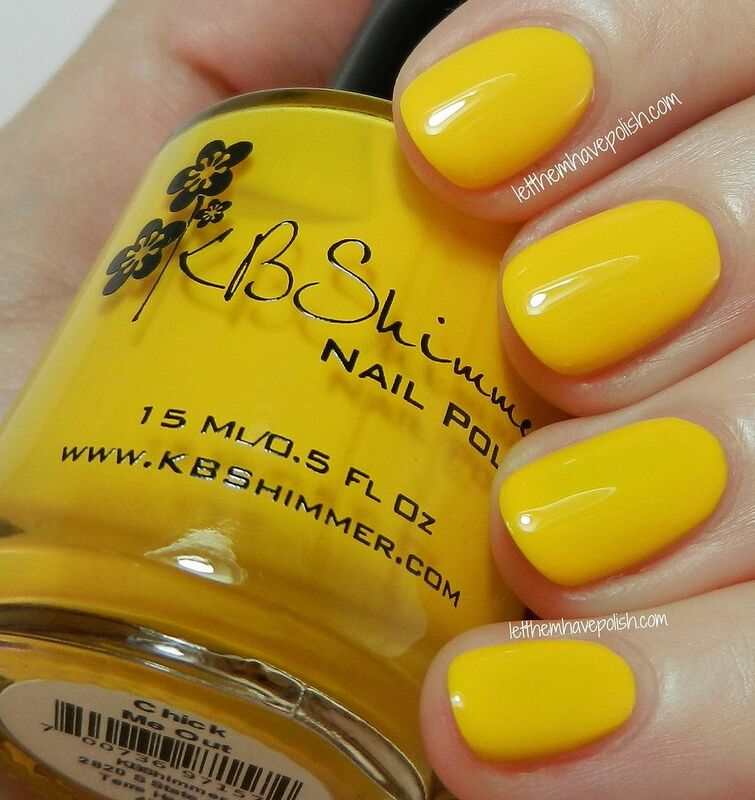 KBShimmer Chick me Out- This baby is a great primary yellow creme. The formula was actually really good! The first coat was a bit streaky. That said, this shade evens out in three thin coats. 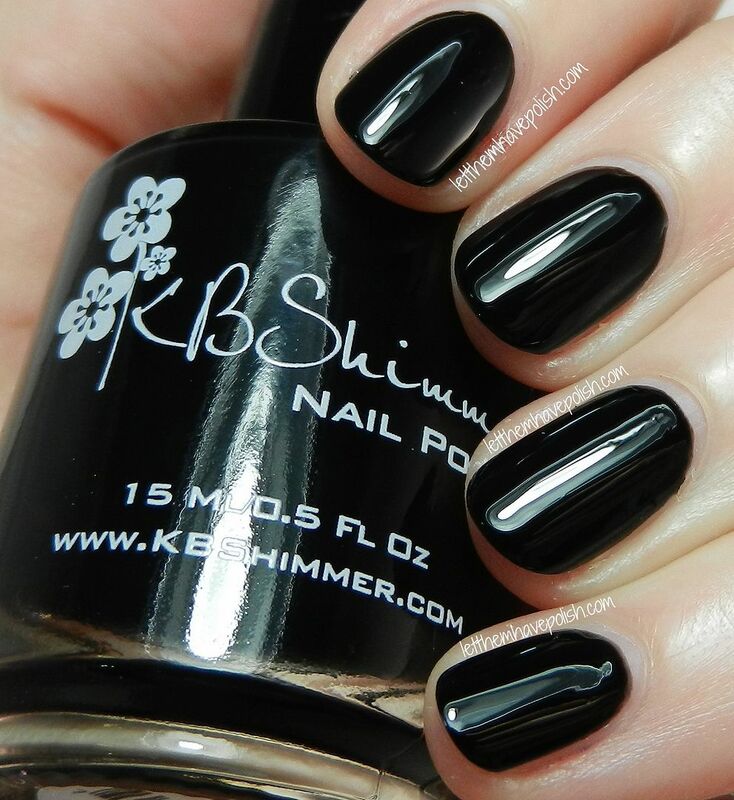 KBShimmer Eclipse- This baby is a super opaque Black creme. The formula is impressive, very easy to work with. I used two easy coats of this shade. One can never have too many Black creme polishes. All of these pretties are available now from KBShimmer.com. I am so happy to see one of my fave indies venturing into creme shades. I can't wait to see what else Christy has in store for us this year. Which of these shades are you loving most? What an amazing showing of all the KBShimmer goodness! I enjoyed this so much! So gorgeous! I need to get my hands on the cremes! Quick and Flirty is so gorgeous! I love all of these! I like the Quick & flirty. Belle of the Mall and Full Bloom ahead are my two faves. I agree you can never have too many blacks!